I really enjoyed making this card. It was pretty simple. 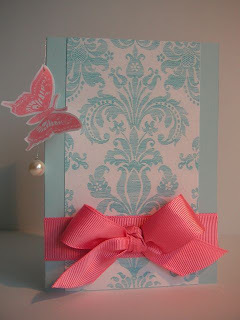 Just some blue card, pink grosgrain ribbon, butterfly stamp (In the garden Anna Griffin), pink Ink it Up, a pearl bead, silver string and a print out of a nice victorian pattern. The pink complemented the pale blue nicely. It turned out quite pretty.